Insadong, Seoul, Saturday 14 September, 8am. However much I plan to rise early and get going with the day when I’m in Seoul, I always seem to be slower than intended. There are too many things to distract me. I have a busy day in front of me: I want to get to the National Museum of Modern and Contemporary Art (MMCA) out in Gwacheon, get back for a 3pm meeting, and then explore the new Seoul Museum and hopefully see what’s on at the Whanki Museum, both of which are in Buamdong, before dinner in Daehakro. That’s South Seoul, back to City Hall plaza, North Seoul, and back. And I still have to top up my SIM card. I potter gently around, sending an email home instead of the normal morning call, finally making it to Seoul Station, and manage to find the branch of the Premium Travel Office which seems to be the only place on the whole peninsula where a foreigner can top up his Evergreen Mobile SIM card with cash. While they process another 50,000 Won of talktime for me, I turn to see the flat-screen TV in their office which is playing a tourism commercial. I see that it’s an English language video promoting the Sancheong Traditional Medicine Expo. I even find that I feature in it – in footage from the opening of the 2011 Herbal Medicine Festival, at which I was formally appointed the county’s ambassador. My phone pings with five incoming text messages, one for each 10,000 Won top-up. I make my way back to the subway and catch line 4 out to Seoul Grand Park and hop on the shuttle bus to the MMCA. For the first time ever, the bus is full. It’s mostly standing room only. I manage to get a seat, and because I’m a foreigner everyone left the seat next to me empty: none of the crowd of energetic 20-somethings feels that they want to sit next to me. 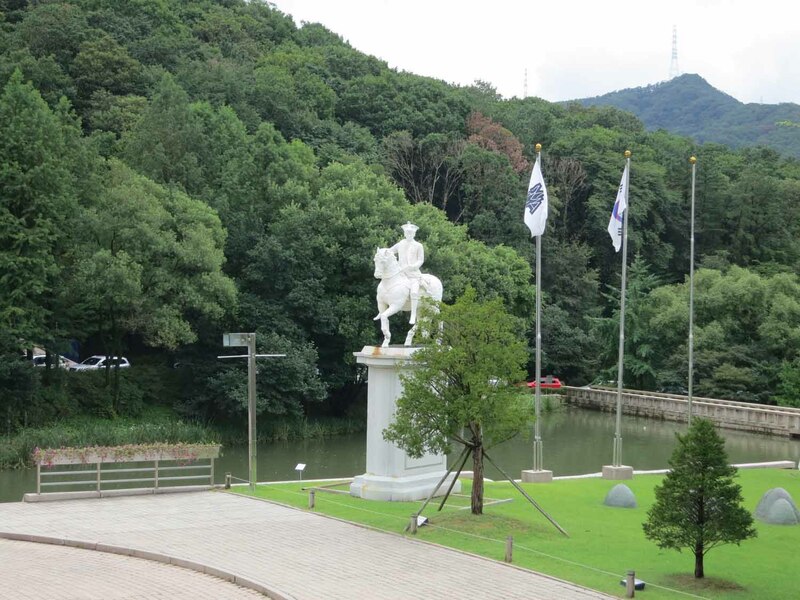 We arrive at the museum, and I wander round to where I know Shin Meekyoung’s equestrian statue will be waiting for me. On her Facebook page I had seen pictures of it being installed, so I knew where to find it. For me, Facebook is becoming an essential tool as well as a monumental distraction. Yes, people post links to mindless articles, and sponsored posts clog up the reading experience, but it’s an unbeatable way of finding out what people are up to, and many an event I have only found out about because it has been “suggested” for me on the basis of what my contacts are doing. 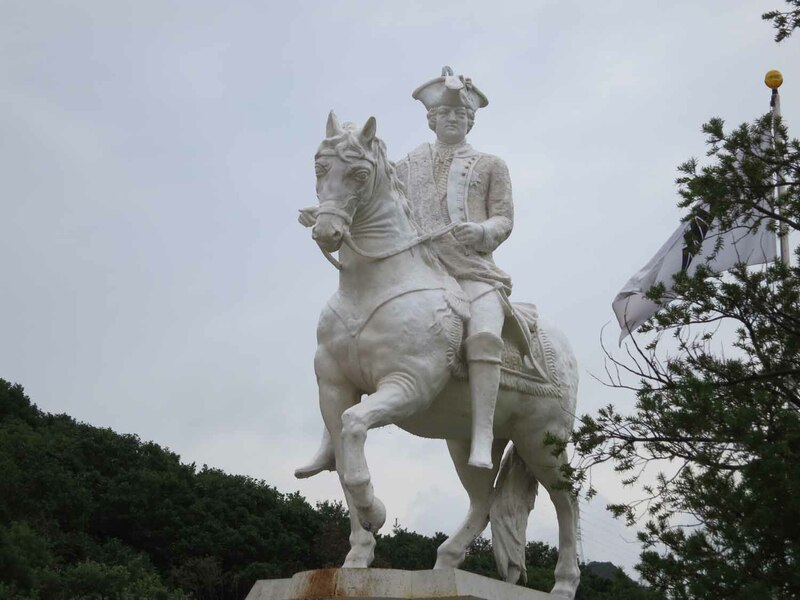 The statue still looked like its photograph, unaffected by whatever summer rains there had been. It is still white and uneroded. It has only been in place since mid-July, having been installed as part of the Artist of the Year exhibition, in which Shin is up against three other shortlisted artists. There’s a queue at the ticket office from the busload of visitors I came with, so I decide to take breakfast in the café while the queue dies down. 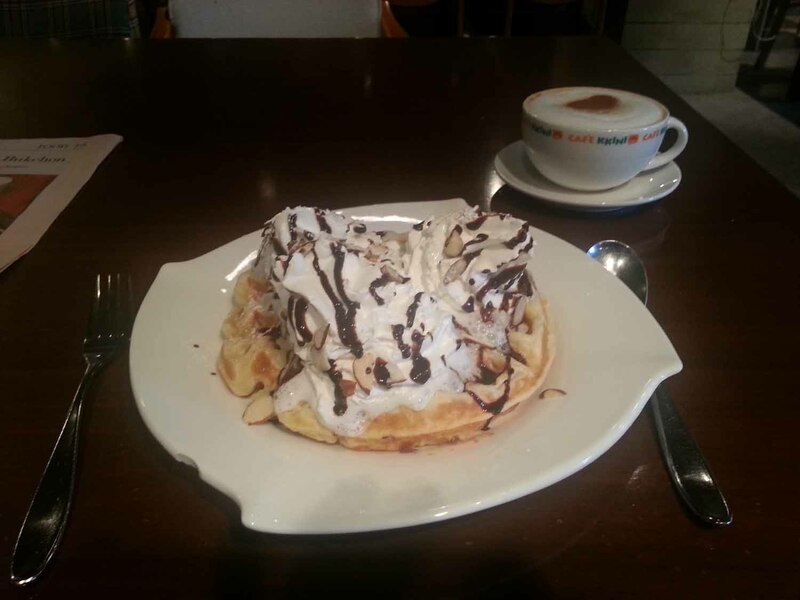 Coffee and a rather deluxe “standard” waffle (I hate to think what the special waffle might look like) raise the sugar levels nicely and give me a boost. It was just what I needed. 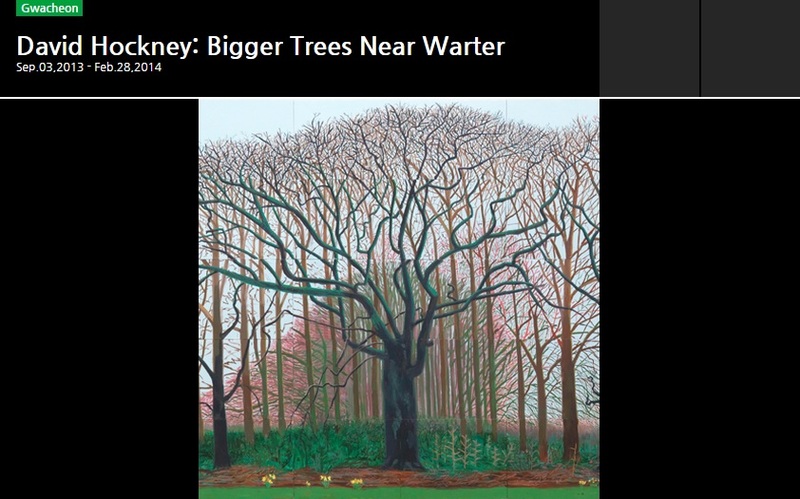 I buy a ticket for the Artist of the Year show, and on the way take a look at the giant Hockney piece which dominates the main gallery for a special exhibition. To be admitted through the rope barrier would cost you another 10,000 Won, but the work was viewable from anywhere in the museum for free. 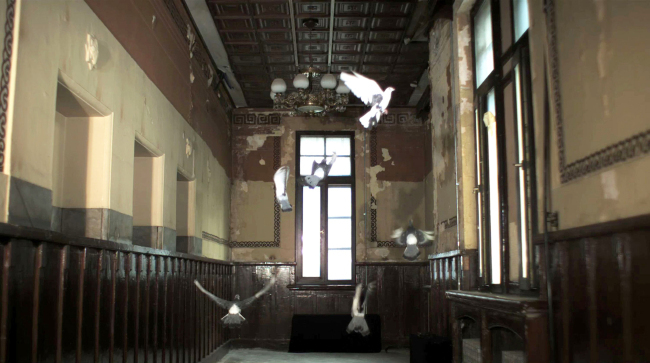 The first room of the Artist of the Year exhibition contained video and installation work by Ham Yang-ah (함양아). Her Nonsense Factory, according to the catalogue “depicts a factory in a fictional location, adopting a novelistic device of “coverage by a reporter of a company newsletter”. “It is fair to say that the meaning of Nonsense Factory is the meaninglessness of contemporary society,” acknowledges Kang Sumi, professor in the department of painting at Dongbuk Women’s University in the catalogue. Having read that, I feel somewhat less inadequate that my first reaction to Ham’s work was one of incomprehension. But then, I often fail to engage with video work, and often move on without trying too hard to understand it. Had I stayed longer, I hope I would have detected the themes of surveillance and control in society, of exploitation of company workers, and of poking fun at the monetary economy of capitalism. The most significant section of the work was entitled “Artists’ Room”, in which the artist treats his assistants like dirt while telling the reporter for the company newsletter that the most important attitude for an artist is the understanding of other people. As ever, with these more conceptual works one stands the change of appreciating them better once one has had a bit of information about the artist’s intentions; but when there is limited time one has to come to the work afresh without any preconceptions, and run the risk of being baffled, as I was. In a contemporary art museum one is so unused to seeing conventional realist painting in oils or acrylic that when you come across them you don’t know how to react. 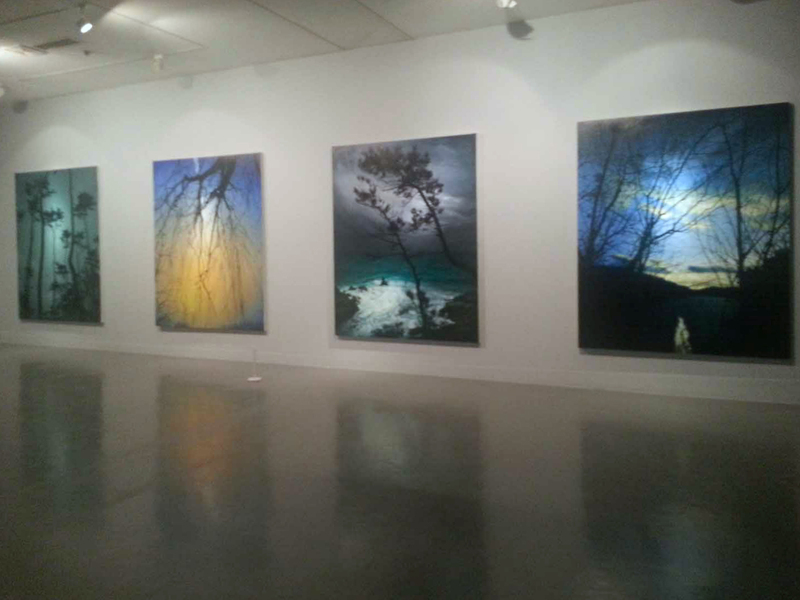 Kong Sung-hun’s (공성훈) collection was of large landscapes, dark and atmospheric. 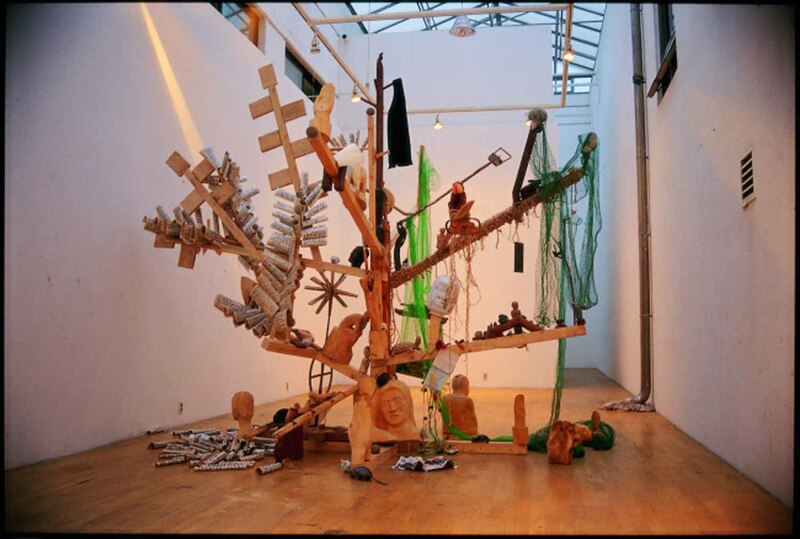 According to the press release, the works depict “nature at its exhausted state after having been endlessly exploited and ingested by people until it became no more than a prop on a theater stage”. The third section contained Shin Meekyoung’s work. The show was a dramatically lit and dramatically laid out retrospective of her work which constantly enticed and surprised you with different sightlines and vistas. The deep red of the walls and subtle lighting was an experience in itself. From an early work in which she models her own head out of soap, to her latest works that recreated the look of Goryeo celadon, this was a comprehensive overview of her output. The final artist in competition was Jo Haejun (조해준), whose collection Scenes of Between again needed more time to assimilate than I had available. A mixture of installation, video and cartoon drawings, the exhibition seeks to explore Jo’s relationship with his father. The most poignant part of the exhibition was a painting by his father, who once dreamed of becoming an artist and submitted this painting to an art exhibition. It failed to win an award, but now the painting serves as a bridge between father and son. I turned back towards Shin Meekyoung’s display, but at the door through which I had just passed there was a sign the strongly discouraged you from entering. It seemed that there was a strong curatorial preference for you to enter the display from Kong Sung-hun’s room rather than Jo Haejun’s. So I went around again to see if I could engage any better with Ham Yang-ah’s installation, before working my way round to Shin’s gallery, undoubtedly my own favourite of the four. 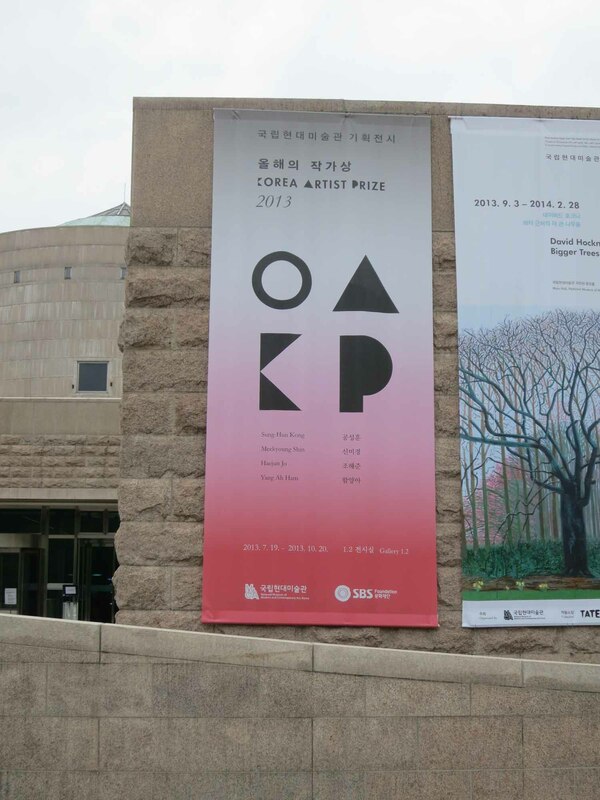 But the winner of the Korea Artist Prize 2013 was to be Kong Sung-hun. Other coverage of the Korea Artist Prize 2013 can be found in the Korea JoongAng Daily, the Korea Herald and on the Korea Blog.